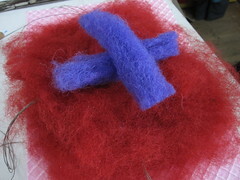 Here is the documentation of my first experience on wet needle felting. 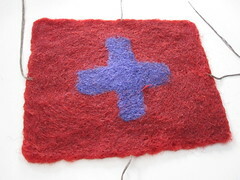 My friend who does a lot of felting showed me how to do it. 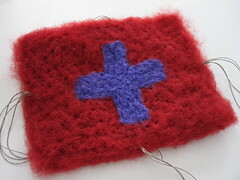 It seems that there are many ways to felt, so this is not the only way, but it works fine. 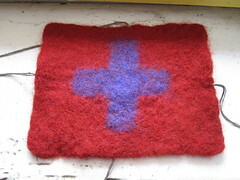 We used felting wool (you can purchase it at craft stores). It comes with many colors.. find your favorite combination. 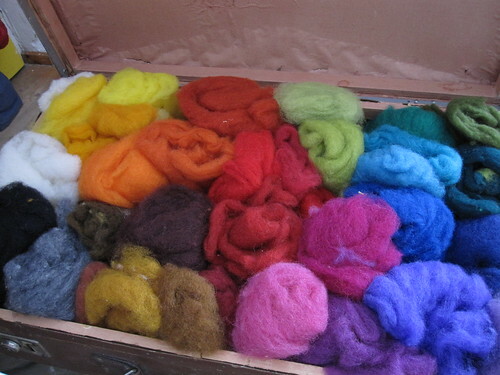 Felting needle can come in different shapes. 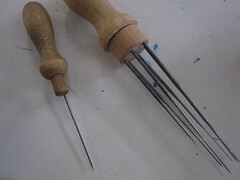 Here we had 1 needle version and 3 needle version. 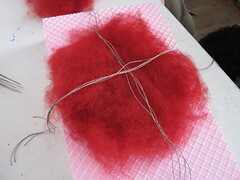 The needle has a lot of sharp bumps to hook the wool. 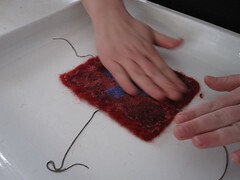 Place a thin layer of felting wool. 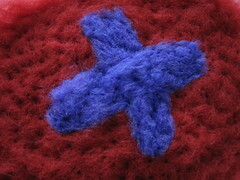 Make it into the shape you like to have. 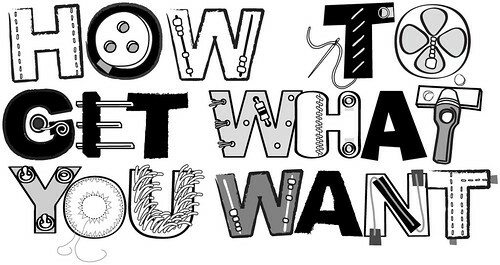 It shrinks quite a bit when you felt, so make sure to spread it big enough. 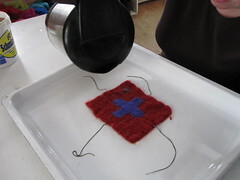 then i placed some conductive threads. 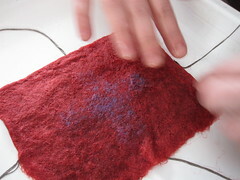 This is because I wanted to make a test if we can mix conductive materials in felt (and it works!) 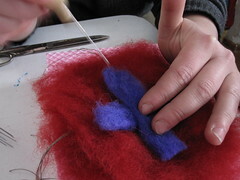 Place the top layer to embed the conductive thread in the felt. 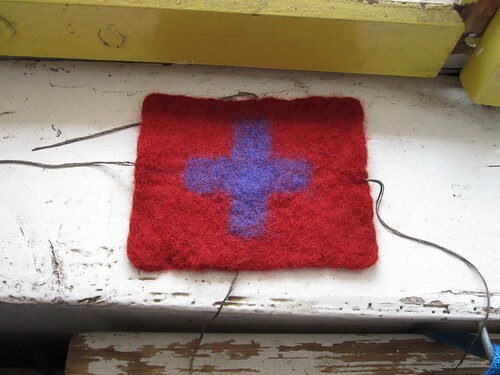 Then I added the little purple cross as a decoration. 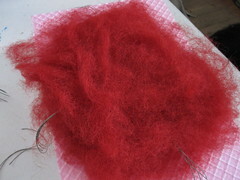 Then start punching with felting needle. 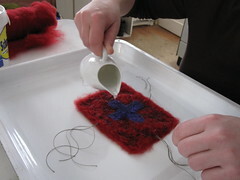 I place the piece on small foamed styrol so there are a space for needle to go in. 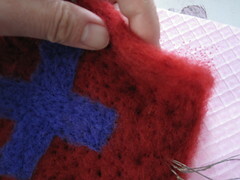 Keep pocking it until the wool gets stick together. When you turn it around, you should be able to see the color from the front (purple cross). Now, place it somewhere it can get wet. I used oven tray. pour cold water, and soak it well. 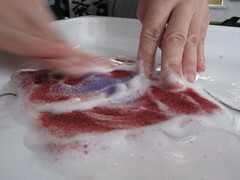 Take some soap in your hand and rub it gently. Make sure to do it on the back side and edge too. The soap can be normal hand soap. 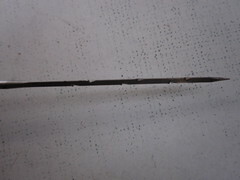 Take it under cold running water and rub it hard. 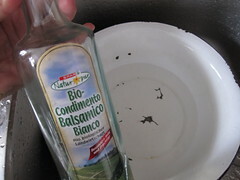 Place it back on the oven plate again and pour hot water. Take some soap and rub it in. 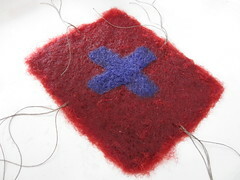 The felt piece can be hot, be careful. This time you can rub it quite rough. 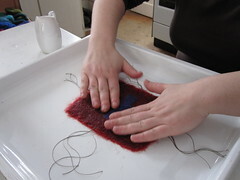 Repeat this process until the felted piece feels firm and tough in your hand. 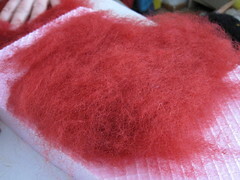 It really changes the texture. We repeated this process for 3 or 4 times. 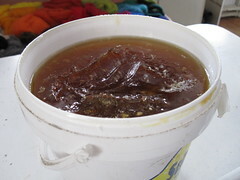 This is to get rid of the acid in the wool. 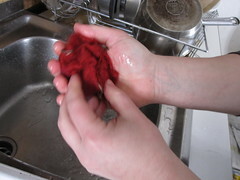 Then wash with running water and dry it.